Besides ... as I told Ben when he lost a toe to cancer: That's one less toenail that has to get cut. Raven has a whole foot's worth of toenails that she doesn't have to have cut. Our dog Chris lost his sight last year to diabetes-induced cataracts. I love to see him dream because I know that for those few moments he can see again and chase rabbits and bark at anything that moves him! Greyhounds run in their sleep too. 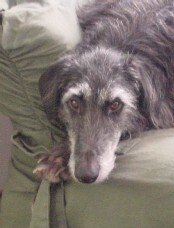 My younger hound, Summer, lost her leg 12 days ago to osteosarcoma. It's been a non-stop haze of complications ever since. I notice the same thing, though; while dreaming, she's still trying to get that squirrel.